The Detroit River Canadian Cleanup and Essex Region Conservation joined U.S. 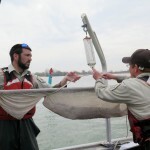 Fish and Wildlife Service researchers on the Detroit River in April 2017, who now estimate there are over 6,000 Lake Sturgeon in the Detroit River, and over 30,000 in the corridor from Lake Huron to Lake Erie, making it one of the healthiest populations of sturgeon in the Great Lakes. 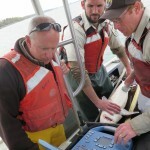 The data was collected through ongoing mark and recapture studies undertaken by the U.S. Fish and Wildlife Service, Michigan Department of Natural Resources, and Ontario Ministry of Natural Resources and Forestry. 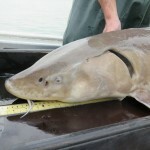 Researchers are excited by this good news because the Lake Sturgeon population in the Detroit River is estimated to be about one percent of its former abundance. 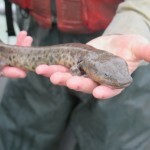 Over the past century, fish populations in the Detroit River have been impacted by the construction of shipping channels, loss of coastal wetlands, ‘hardening’ of shorelines and installation of steel break walls, water pollution, and dredging of limestone bedrock that was spawning habitat for Lake Sturgeon and other native fish species. 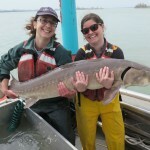 The creation of the Lake Sturgeon spawning reef at Fighting Island demonstrates binational collaboration, partnership and stewardship of shared resources. 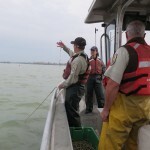 The success of this fish habitat restoration strategy will help strengthen and improve the fishery in the Detroit River and the entire Great Lakes. Credit for this successful project is owed to many project partners including Environment and Climate Change Canada’s Great Lakes Sustainability Fund, Ontario Ministry of Natural Resources and Forestry, the Ontario Species at Risk Stewardship Fund, DTE Energy, U.S. 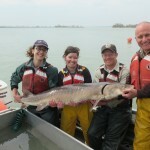 Fish and Wildlife Service, U.S. Geological Survey, University of Michigan Water Center, and the Great Lakes Restoration Initiative. American partners have an additional reef planned near Historic Fort Wayne, the seventh spawning reef constructed within the St. Clair and Detroit rivers over the past thirteen years. These projects are part of a comprehensive remediation plan under the Area of Concern program. 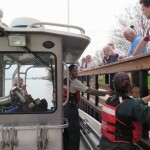 For more information about these projects and other restoration projects taking place in the St. Clair – Detroit River System, please visit scdrs.org.